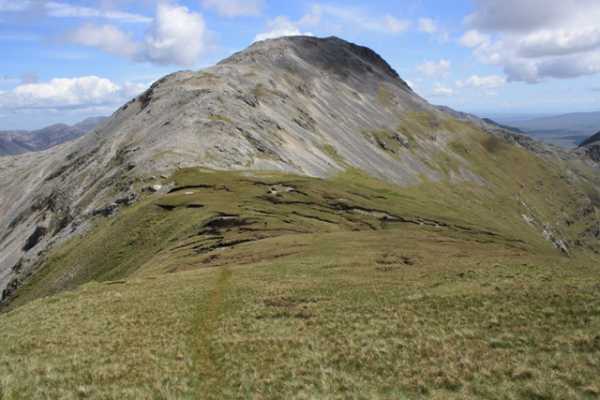 Arriving at Benbaun from Knockpasheemore ridge involves negotiating 270 metres ascent over varied rock, scree and intermittant grassy patches. Thin trails appear and disappear in the scree, helping at times to avoid that 'one step up, two steps back' feeling. I was glad to have my sunglasses in the bright sunlight as the glare off the white rock was dazzling! Arriving at the curiously broken summit trig pillar, I was presented with the magnificant views south to the Bens of Glencoaghan, and west to Muckanaght & co. Perhaps what makes these mountains all the more startling and impressive is how they contrast with the deep valleys below. Both Bencollaghduff and Muckanaght for example have grey cliffs plunging several hundred metres to the green and verdant valleys at their bases.